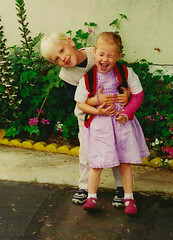 Since an early age, Luc has been adept at making his sister laugh. She is laughing in her hysterical way: multiple staccato gulps of air in quick succession. I have to pull the phone away from my ear a bit. – Dad, there are cats on the roof. It makes my day, this random observation shared with me in an equally random phone call. I haven’t seen her all week. I’ve been on the road. I won’t be seeing her anytime soon, either. She is in the parking lot of the Ronald Macdonald House near Children’s Hospital, where she is preparing to board a bus headed for Apple Valley for RMHC’s annual winter camp. Her brother is joining her. Sending Luc along was a chore. He didn’t want to go. Though he loves camp, he is uncomfortable with the Ronald Macdonald camps. He is uncomfortable with anything that explicitly addresses cancer. But we insisted. The camp is a great place for siblings. Three years ago, Luc befriended a young boy his age whose sister was also battling a brain tumor. They became fast friends. Two years ago, that boy’s sister lost her battle with the disease. Jordan openly wept when she received the news, but Luc was silent. This year, his friend is returning to camp. Both families thought it would be good for the boys to reconnect. I hope the experience is good for Luc and that he has fun. He keeps much to himself. While it is a sign of his maturity, it is also cause for concern. I hope he realizes that he is not alone, that life is about living, and that no matter how dark the days may or may not grow, he is never to blame. It is my wish that some day soon he can survey the whole journey and see the beauty on the fringes. I know that, just as it shapes Jordan’s life, it shall endow Luc with an indelible point of view.